Beebe Healthcare is proud to recognize Janet Miller, Environmental Services Tech, as the January 2019 recipient of the Living Our Values Every Day (L.O.V.E.) Award. All Beebe team members pledge to follow a system of values. As a patient or visitor at Beebe, you may see these value statements posted. We invite you to help us be mindful of our values as we care for you and your family members. Janet was recognized for going above and beyond to make a visitor more comfortable. Dave McGown, who submitted Janet’s L.O.V.E. Letter, wrote that he saw Janet speaking to a visitor who was uncomfortably stretched out on a sofa outside the operating room hallway. Janet demonstrates many of the Beebe values, including acting with passion and love for others to make a difference and building trusting relationships with compassion and kindness. Great job, Janet! For more information about Beebe Healthcare’s values and how team members live our values every day, go to www.beebehealthcare.org/our-values. For more information about Beebe’s “Celebrate Excellent Care” program and how you can support Beebe Healthcare, the local non-profit community healthcare system, contact the Foundation at (302) 644-2900. 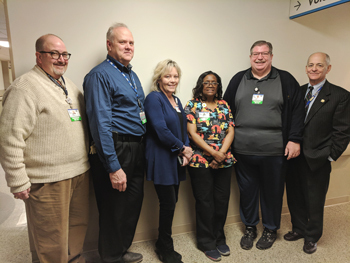 Caption: Environmental Services Tech Janet Miller (third from right) is the recipient of Beebe Healthcare’s January 2019 L.O.V.E. Letter. Also pictured from left to right are Rick Schaffner, Chief Operating Officer; Tim Gwaltney, Director, Environmental Services; Katie Halen, Vice President, Human Resources; Dave McGown, Systems Analyst; and Jeffrey M. Fried, President and CEO.